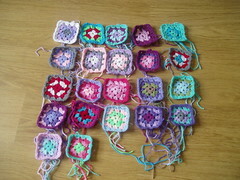 These are all the granny squares I've done so far. They're made with a bag of various colours of wool that Mum gave me. Quite a few of the colour choices were based solely on how much wool was left! This pretty much represents all the crochet I've done. I started because I wanted to do something useful that was similar to cross stitch and I could do while watching TV (I get bored if I just watch and don't do something else at the same time). Although cross stitch was useful when I made my friends a wedding sampler for their wedding present. Granny squares are fairly easy to do because they only involve two types of stitches: chaining and treble crochet. The tricky part comes in because the terminology is completely different in America and Britain and they call treble crochet double crochet. So the first thing you do when you look at a pattern is establish which language it's in and what they therefore mean. It's not immediately obvious because there's also a British stitch called double crochet... I use British terms, not least because treble crochet makes sense because you pull the wool over the hook three times. I can see that you have mastered granny squares now. They all look very neat. Thanks. Although some of them are bigger than others.